Serve beer, cocktails, and soda in these reusable, 16 oz custom printed plastic souvenir cups. A great addition to any milestone birthday party, your guests can take their cups home as souvenirs after your party ends. Made from BPA free, frosted, flex-plastic, these cups are dishwasher safe in the top rack and will comfortably hold around 12-14 fluid ounces. 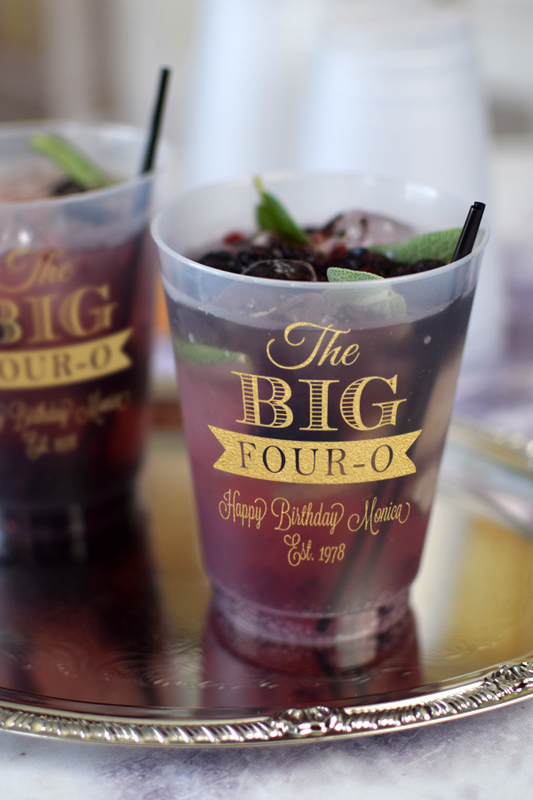 Personalize your cups with a festive adult birthday design and your own custom message printed in your choice of imprint color and lettering style. These cups are the ideal size for holding beer, cocktails, and pop. Two-sided printing available at no additional cost. I am very happy with the results. There were no problems with ordering, shipping, or the product itself. The party is not for another few weeks but I expect the cups to be a big hit! Received my order of personalized cups. They look great! Would definitely refer others to buy. The team was very easy to work with on my custom design and the actual product is great. Going to use this weekend, but I know my guests will love them! Cups were easy to order with many options and shipped a day earlier that expected. Very pleased with the order! The cups look great! The staff was very helpful in making sure they were exactly how I wanted them to turn out. Excellent product and excellent service! The cups for my hubby's surprise 50th birthday were great. Loved having this keepsake for our guests to take home. Great product. Purchased these for a birthday party. Everyone thought they were great. Cubs held up very well no problems good graphics. Came out very nicely. Would have liked a little bit sturdier but can go through the dish washer. Customer service was very helpful and professional. Would definitely recommend company and products. I was looking for something signature for my 48th birthday party coming up and decided to try these cups and they are everything I had hoped theyÃ¢â‚¬â„¢d be. Tippy Toad has a repeat customer for sure. Thank you. Cups are great. Company is super to work with. I ordered these cups with plenty of time before my party and they came even sooner!! 2 cups in my order arrived broken and I spoke with Molly from the company. She was completely polite and offered to refund my money for 2 cups. I am very thankful I purchased these cups for our 40th birthday party! These were perfect for my husband's party!! They came quickly and were very durable. I ordered these cups for my daughter's 40th birthday. They are really good quality. Very sturdy and the quality of the print is high. I would recommend this to anyone who wants to do a little something special with their beverages. The design templates looked great and were easy to use. I also liked having the ability to make changes before having them printed; I only needed to re-center one line, but Molly quickly corrected the issue. The quality of the cups and print (I used the metallic gold) is perfect. I would definitely recommend this company. So excited to share my custom cups with my family & friends. They are perfect, Molly was very helpful with my order & very professional. These cups were such a huge hit at my dad's 60th Birthday party. When ordering I had an issue with my credit card information not being accepted so I called them and a very lovely woman by the name of Bailey helped me out. It was so refreshing to call and speak to someone so helpful & sweet, instead of many other companies who use 3rd party companies for issues like that. No automated system is an A+ in my world. At the party everyone was asking for information on where they could order these cups for their upcoming events. They look exactly like the photo and are a very good quality plastic. We had a lot left over and have been using them at home for our daily use. We got them so people could have a keepsake from the party and many people did take them home. We plan on doing a few yearly parties and will DEFINITELY be ordering more cups from Tippy Toad. Love the cups. Good quality. They look exactly like the picture shown. I ordered the plastic glasses for my husbands surprise 60th BDay party and they were a hit! The Gold imprinting was clear and concise and since the back was blank, I decided to add a king's crown. Tippy Toad sent me a selection of crowns to choose from! Beautiful! Easy to order and arrived a day early! The ink color and fonts chosen were exactly what I had designed. Perfect! Really perfect! They look perfect and were shipped quick! I ordered these cups for my dad's 60th birthday party and cannot wait to use them! And they make for a perfect, little party favor at the end of the night! Hands down the easiest and best company to work with. Amazing, quick responses from customer service. They work with you to make sure your order is 100% perfect before finalizing. I cannot wait to do business with this company again in the future!